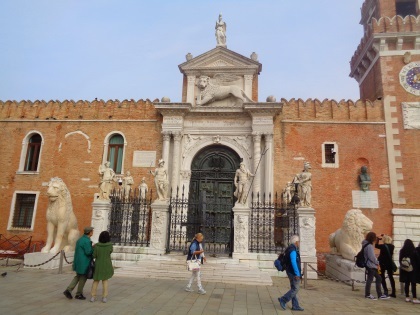 Detailed information about the Arsenal of Venice, the Maritime Museum and the famous statue of the Lion of Piraeus. For a long time, the Arsenal in the east of the island of Venice was by far the largest shipyard in the world. The first ships were built here in the 12th century. For many centuries the Arsenal was a huge and very efficient shipyard, especially for warships. Already several hundred years ago warships were manufactured in Arsenal in a kind of assembly line system. In many years dozens of large ships could be produced per month. Without the arsenal, Venice would hardly have been conceivable as a great naval power. Especially the ships, whether merchant ships or warships, were of great importance for Venice as a world power. The gigantic Arsenal site covers almost 10% of Venice's total area. 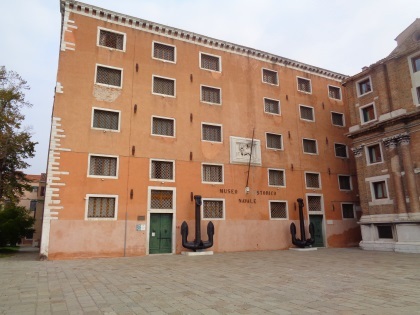 Many of the huge historic buildings in the Venice Arsenal are largely preserved. Unfortunately, it is not possible to visit the Arsenal. Today it is the military area of the Italian army. In the arsenal, the ships were not only built. It was also the great base of the Venice fleet. Also many boats in the Arsenal were repaired and modernized. The Italian name is: Arsenale di Venezia. 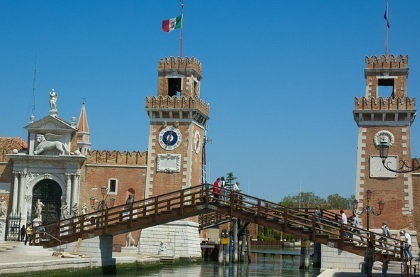 It is very far on foot from the train station and bus station of Venice, as the Arsenal is located at the other end of the big old town island. It takes about an hour to get there and an hour to get back. So using the public transport water bus is useful. From Piazzale Roma (bus station) and the main train station you can take 3 different lines to the station "Arsenale". The vaporetto line 1 goes through the Canale Grande, the lines 4.1. and 4.2. go around Venice in different directions. If you have never went through the Canal Grande before, line 1 is certainly interesting. Otherwise, it is also exciting to go around the whole island of Venice with a vaporetto. After getting off at the Arsenale vaporetto station, walk a few metres to the right along the sea until you reach the next small bridge. You are already standing in front of the museum (see below). To the actual entrance of the Arsenal, walk along the path from the sea to the museum along the canal (about 200 metres). At the moment there is only one boat shed to visit. In the halls several larger, historical ships are exhibited. Not uninteresting. Italian name: Padiglione delle Navi. Admission: 5 euros (3.50 euros with discounts for children, pupils and students, for example, children under 6 do not pay admission). Opening hours daily from 8:45 to 17. Prices and opening hours: Autumn 2017. This open part of the museum is almost directly at the famous historical entrance to the Arsenal with the two mighty towers on the left and right (see picture above). The currently open boat exhibition is at the marker, the closed museum (booth 2017) is along the canal to the south (name on map: Museo Storico Navale). Otherwise, you can only take a look at a small part of the area in front of the entrance to the Arsenal grounds, preferably from the Arsenal Bridge (the dark wooden bridge at the top of the picture). On the left in front of the entrance stands the famous statue "Lion of Piraeus". This statue once stood in Piraeus (Greece) but was taken to Venice by the Venetians at the end of the 17th century as spoils of war. The lions of Piraeus are a very popular photo motif. The predators made of light marble are more than 3 meters high.